Certainly one of the most common questions we receive is – “How did you do that?” While not sharing everything, we can give you an idea of the work and detail that goes into each image. Many of the small elements are difficult to see and can really only be appreciated on the finished image. If you look closely, you will understand how much attention is given to each component, in every image. 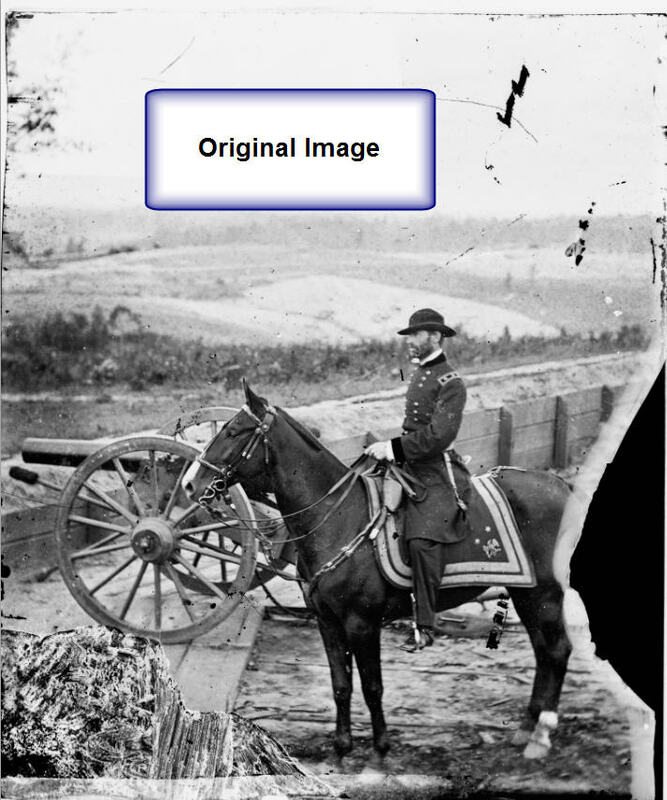 The example shown here is half of a stereo card image of Gen Sherman. The damage is typical of the kind of images we restore and the process that creates the final result. A typical image like this can take many days or even weeks of work. It then has to be repeated for the other side on stereo images! 1. 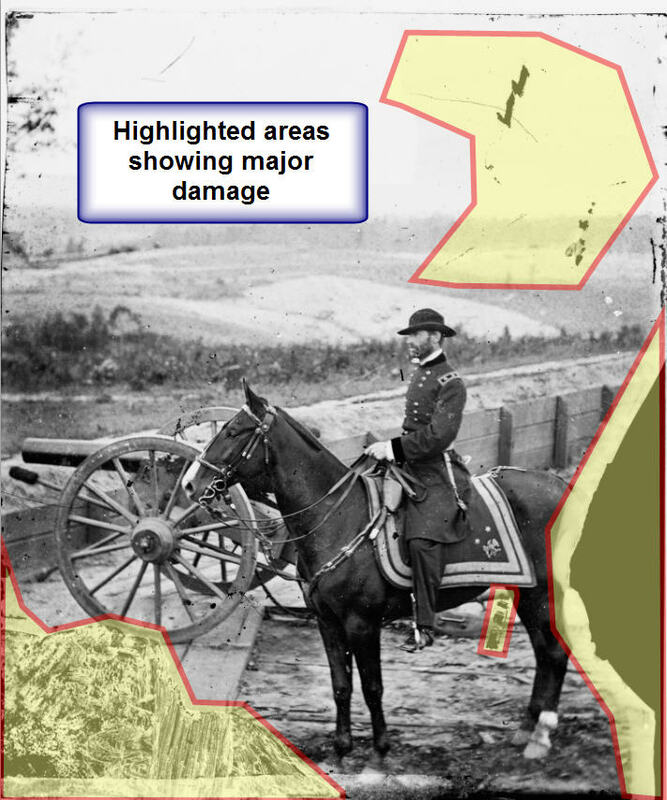 In the original image we see some of the damage areas. Believe it or not, even with major damage this stereo card was still reproduced. Many were produced decades after the war, but still can cost hundreds or thousands of dollars for a single card with this image. 2. Often times multiple shots were taken. The best image was used as the photograph source. 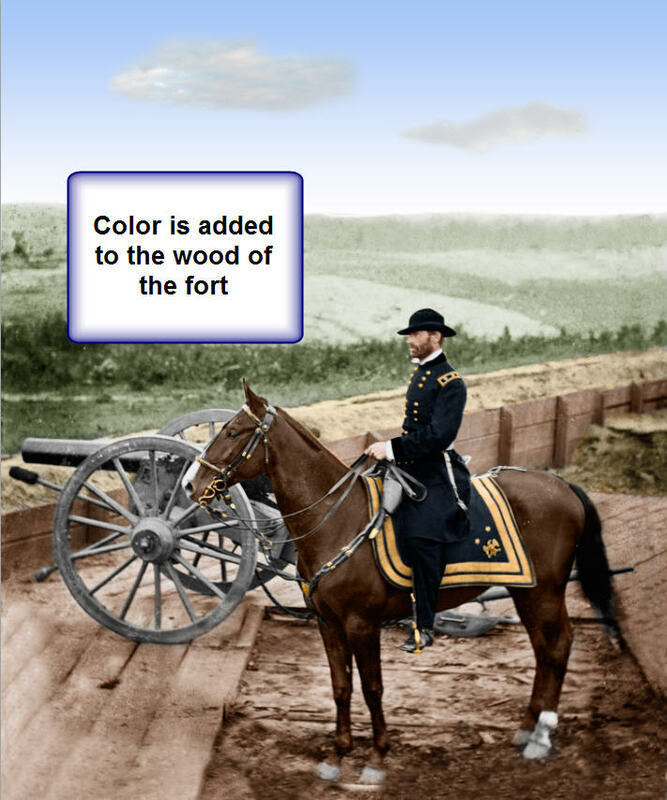 In this case, two sets of images exist (a total of four images two left and two right). The alternate set had some slight blur and some of the detail was lost. It was used to recreate elements missing from this picture. 3. The boards are replicated by either extending the existing lines, or copying from an alternate image. 4. 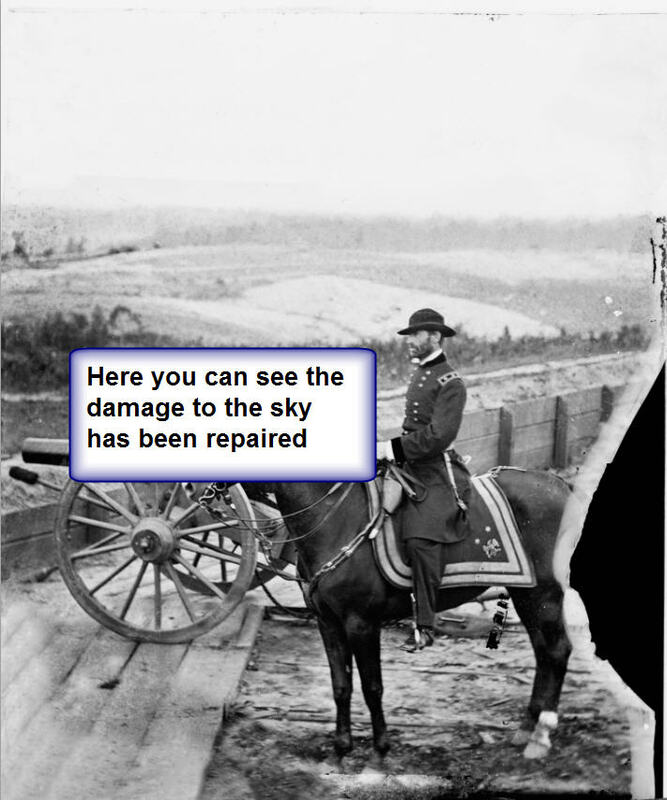 Some things like scratches in the sky are easy to fix compared to the damage on the horse. 5. Finally, using a combination of all four images, the restoration for this half is complete. 6. 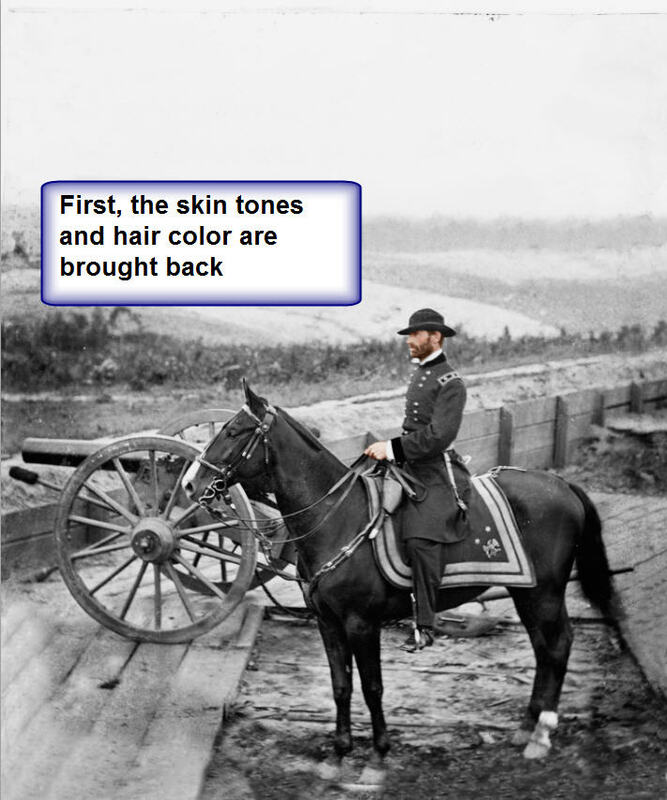 Adding the skin tone gives the first indication that these were “real flesh and blood” people. 7. 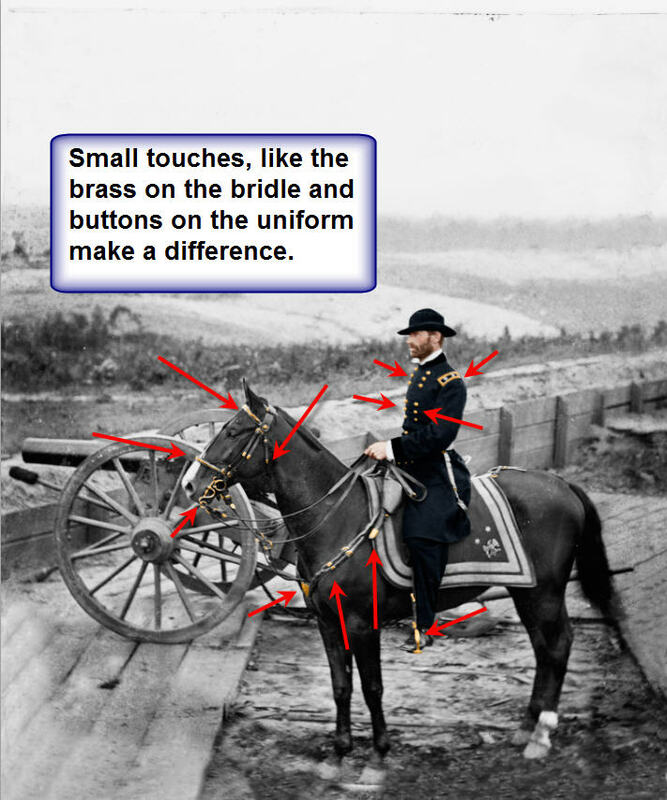 The uniform starts to compliment the skin tone to give life back to the person. 8. Look closely at the last image. 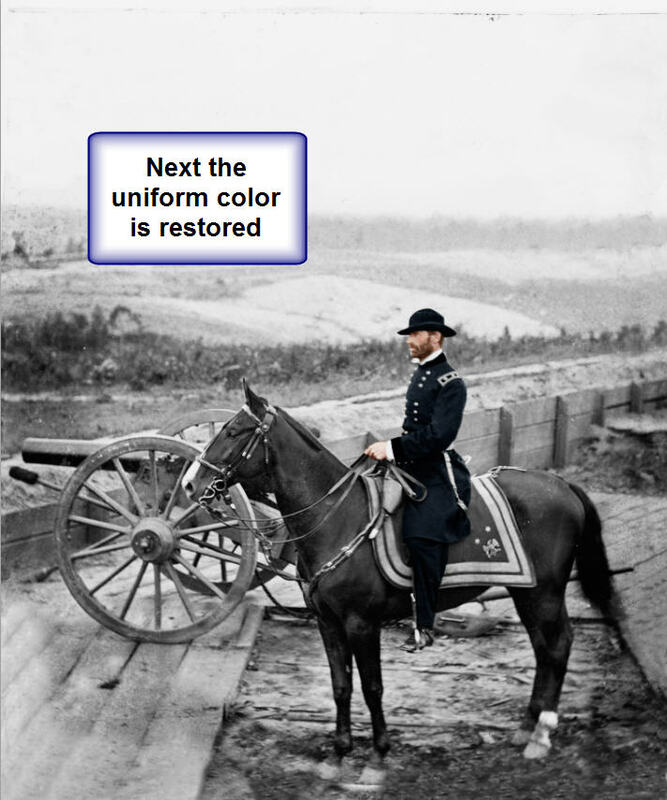 Small amounts of brass color has been added to the uniform, bridle and stirrups. 9. 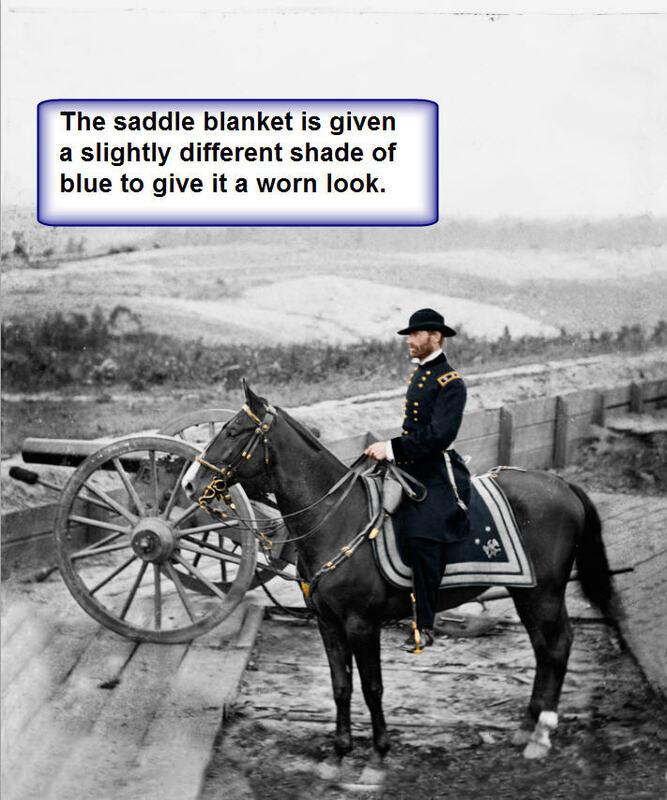 The saddle blanket, while basically the same color as the uniform, was given a slightly faded color to indicate that it has spent time exposed to the elements. 10. The gold trim of the blanket was given a faded look as well. 11. 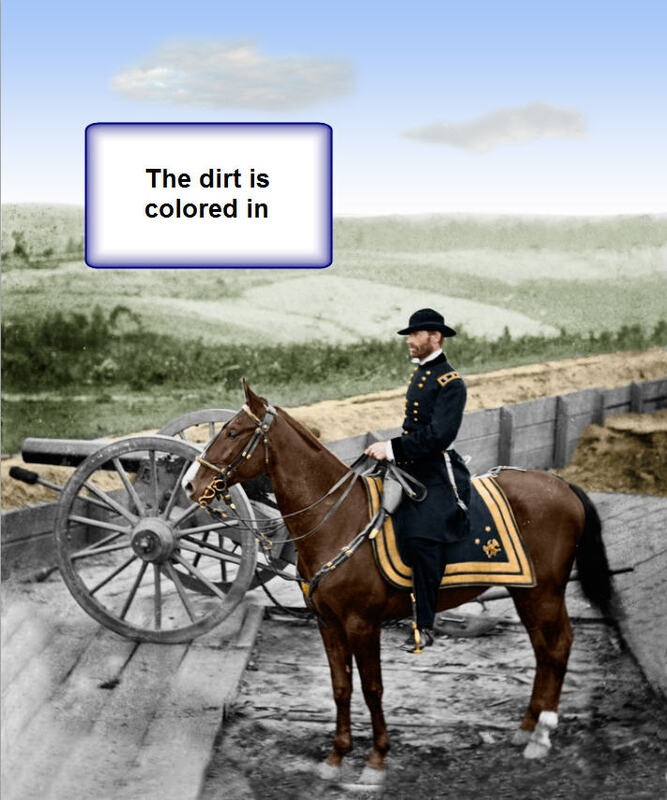 Now that the horse has some color you start to get a sense of what is to come. 12. 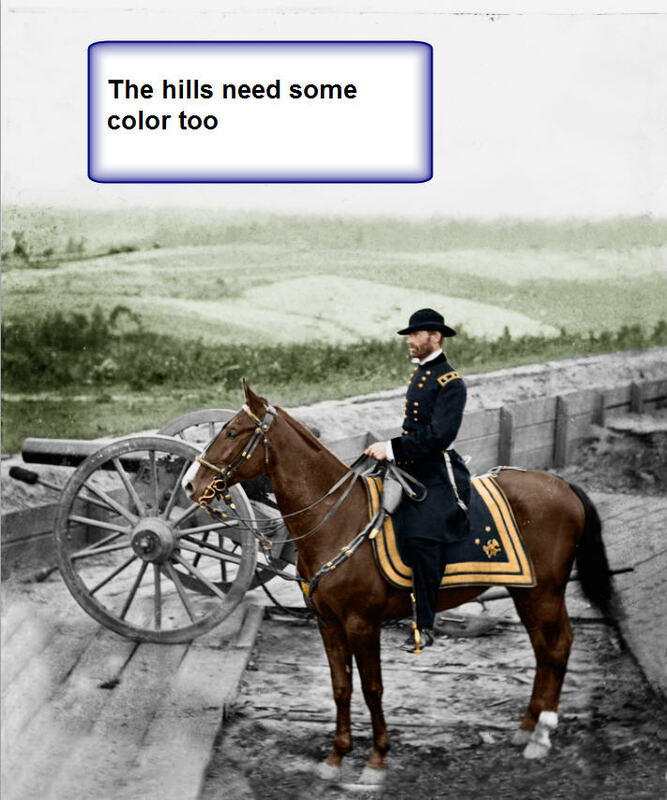 The background needs some color, so the hills are given a green cast. 13. 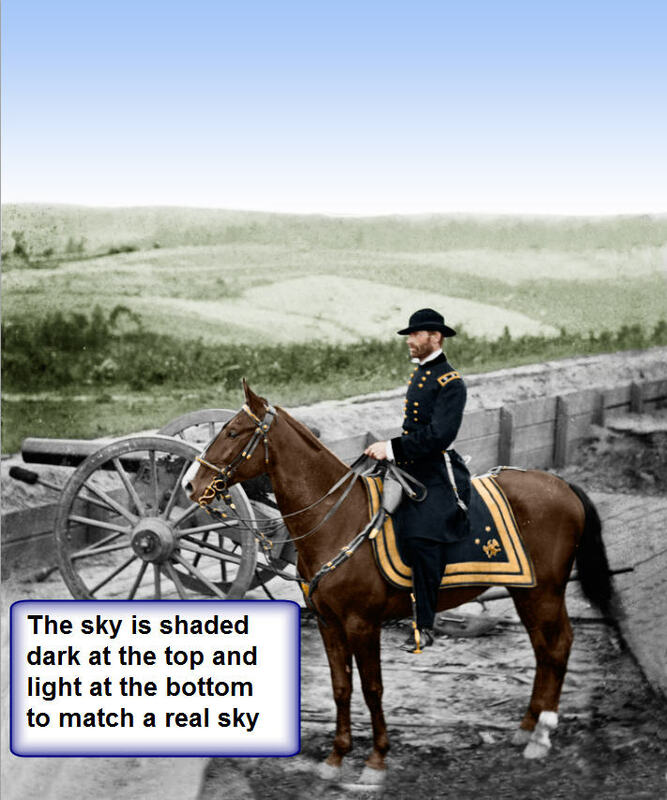 To compliment the background a sky is added. Notice how it looks “fake”. 14. 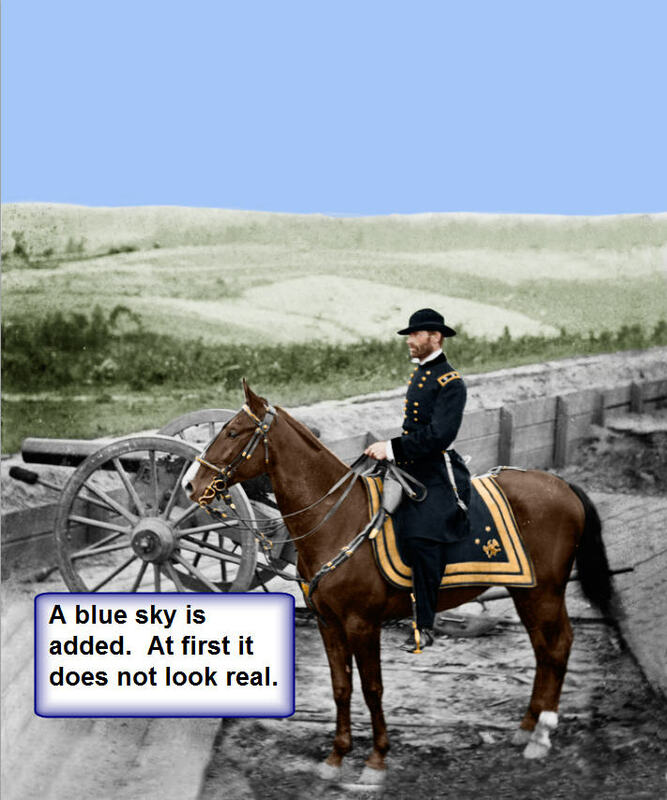 Now the sky looks more realistic, but there aren’t any clouds. 15. 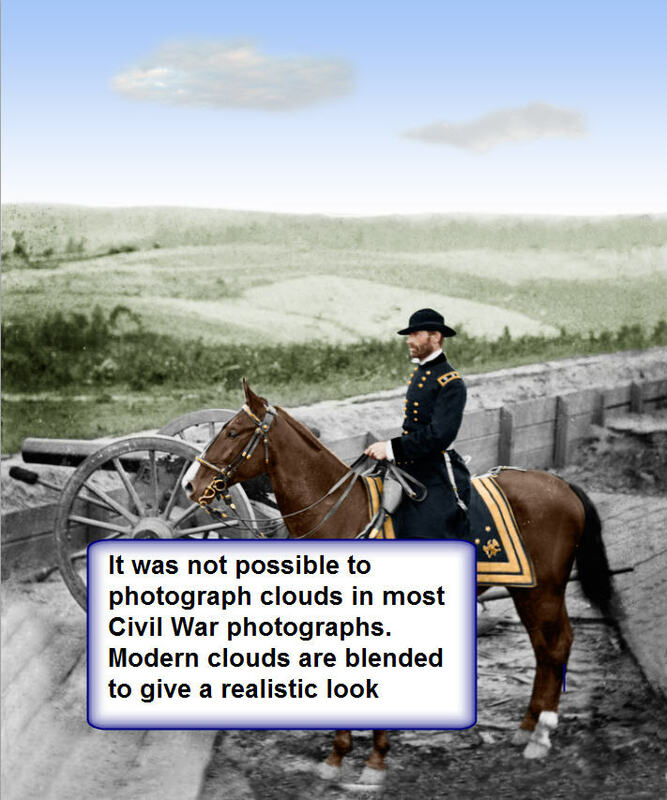 Modern clouds are added to enhance the image. This is the only change made to the original image. 16. 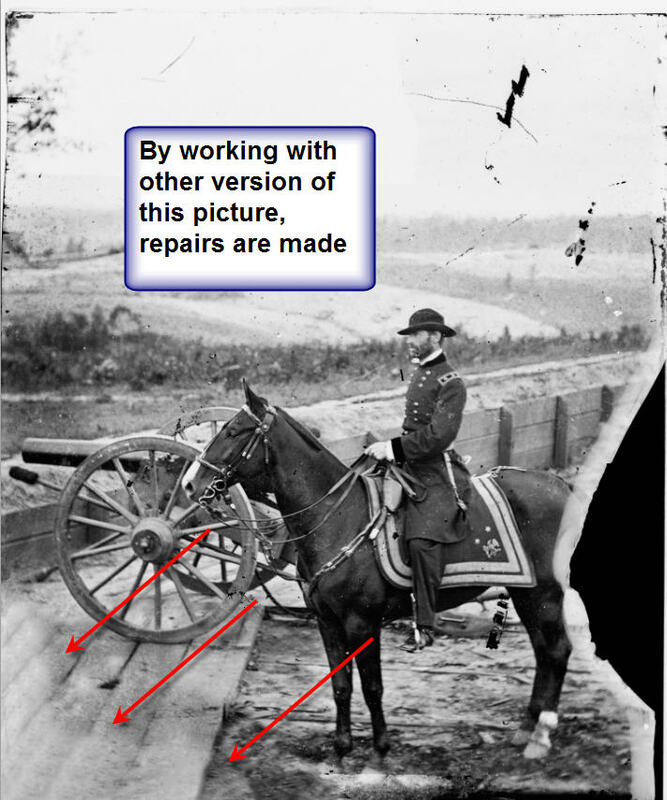 Note that the dirt extends in-between the spokes on the cannon. 17. Things are almost complete here. You start to see the full image and its color. There is still some detail work left to do. 18. Small detail makes the difference between a good and great image. 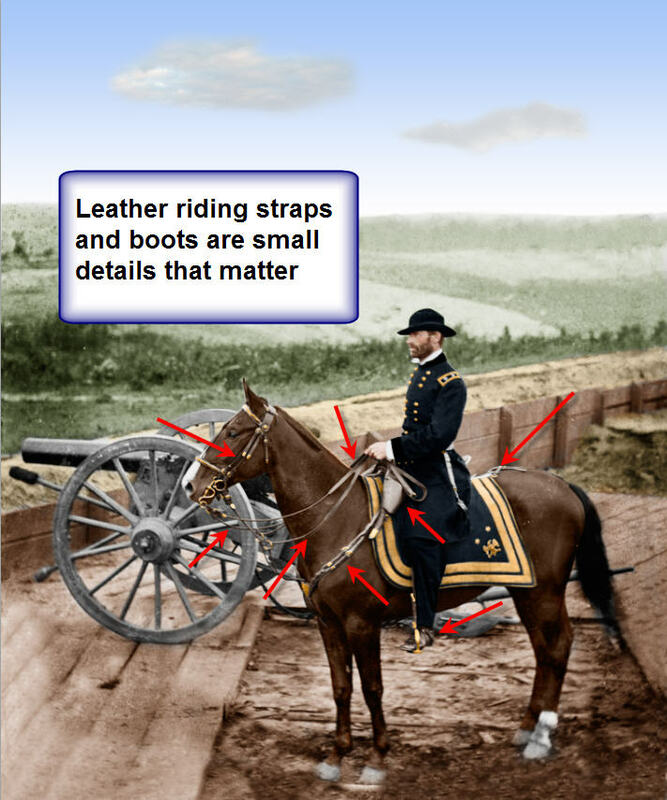 All of the leather straps and saddle are carefully tended too. 19. We are getting to the final stretches. The color of the General’s sash was a faded yellow. This is different than the gold on the blanket or the brass on the uniform. While it is hard to see at this detail it is noticeable in the printed card. 20. 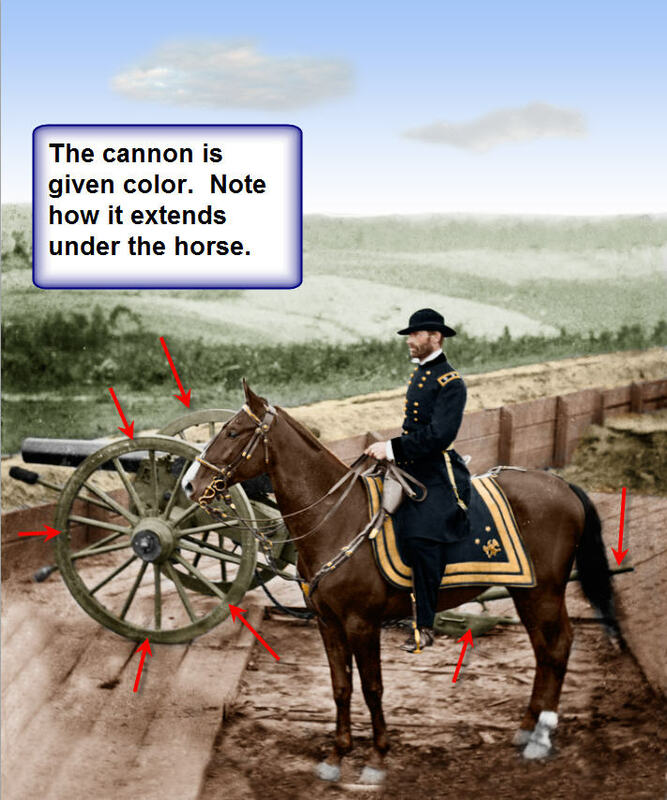 The olive drab of the cannon is added. 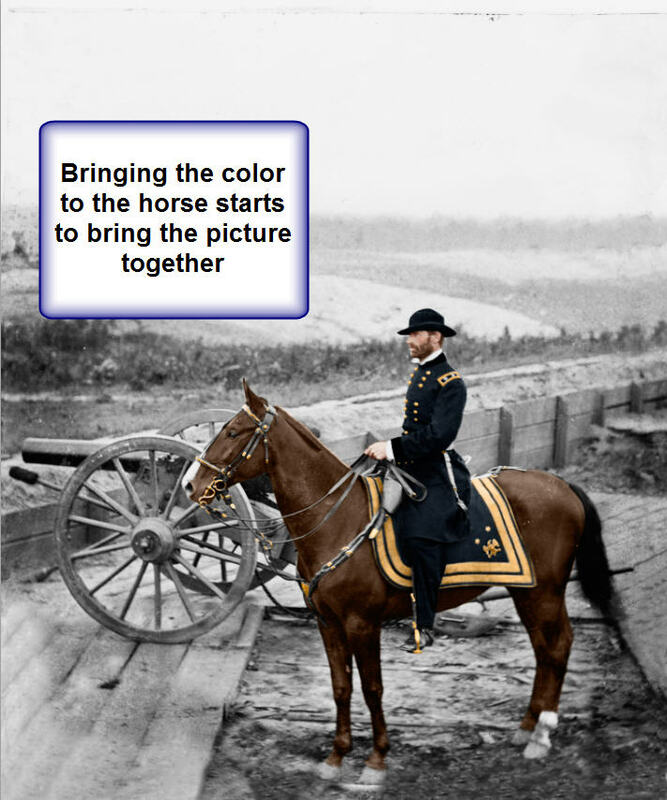 Look carefully and you will see the color extends under the horse. 21. This one is very difficult to see. If you compare the center of the spoke to the previous picture you will notice a small amount of color added. 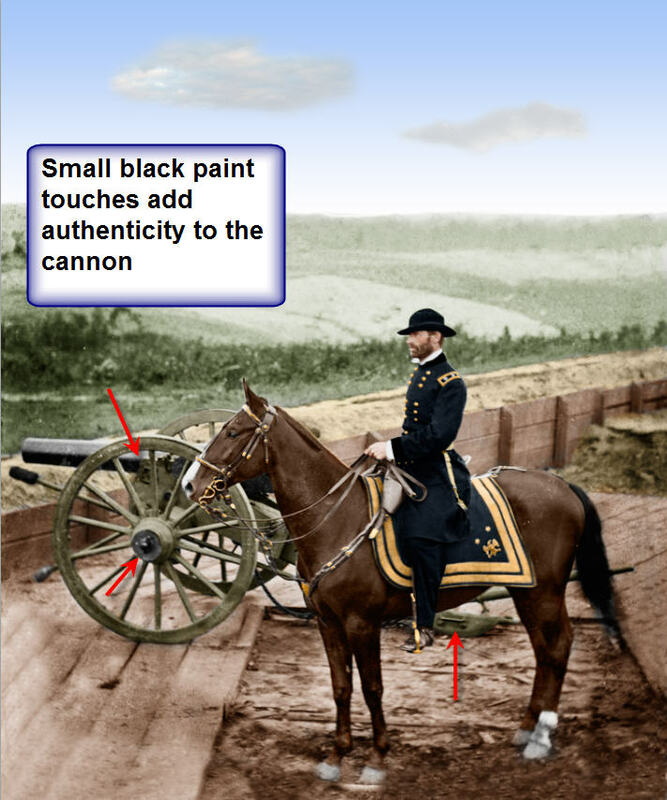 There are a few other areas of black trim that has also been added to the cannon. 22. The final touch was to add just a hint of color to the hooves of the horse. Again it is these small details that make the difference in our work.